Remember, Christmas time is not only the season for kindness to others. It is ALSO the season to be kinder to yourself! This entry was posted in Quotes and other inspirational words, Self Improvement and tagged Daily Wellness Inspiration, Self Improvement on December 18, 2018 by Sharon Halliday Hattingh. Today I don’t want to particularly give you tips and tools about dealing with depression. Today I want to tell you why I totally agree with Alexandra Tilton’s quote and if you happen to learn something along the way, well, that would be a bonus. Depression has been my constant companion for as long as I can remember. About ten years ago a psychiatrist suggested that I may suffer from dysthymia. Now, in layman’s terms, dysthymia is basically a continuous feeling of depression. Occasionally there may be flare ups of major depressive episodes and even the occasional mania, but it is not bipolar disorder. This is different, as the main symptom is an intense feeling of, what I call, the Shadow. Like a functioning alcoholic, I’ve been battling this with a brave face and a deceptively humorous exterior. I am regularly called the sarcasm queen and am known for my twisted sense of humor. People say that I always look at the bright side, that I am a positive person and that I am strong. They apparently like my company, because I tend to entertain them so well with my quirky personality. Fooled them, didn’t I? They have NO IDEA what I am hiding and, because it is not anyone’s fault, I feel obligated not to spread the misery in my soul. Back in the day even my Dad, when I told him I’m about my depression, was shocked. He thought he knew me so well. That particular incident happened just 6 years ago, when I was 45 years old. You can imagine how he felt. As a child I often felt ‘blue’, but took no notice. I had no one to talk to about my emotions and didn’t dare discuss it with my mother. It would have freaked her out completely. She was quite a nervous person herself, you understand. I had no real friends either. Those who I did talk to didn’t really understand the intensity of my emotion at all, not that I blame them. Little kids want to play and teenagers are all about boys and make-up and music, they had no time to be depressed. So the depression simmered just under the surface. My tears went unseen (if it were noticed it was made fun of) and the only person I ever discussed this with was God. That was where I found my peace, in my religion. You may notice how careful I was to keep my depression to myself. I have always felt this responsibility to make others happy. I never wanted to upset anyone and that was perhaps the main reason I kept my mouth shut and suffered in silence. I also knew that the people in my life would make fun of me, should I ever confess that I have depression. Don’t ask me why, but I was just never taken seriously, despite the fact that I took EVERYTHING seriously. The weird sister, the changeling, the outcast….that was/is me. Sometimes it felt as if I was living in a bubble. I can see everything and everybody, even bounce around to please and serve, but no one could see in. When I was 18 this bubble got an instant revamp. It’s outer surface hardened into a tough shell, unbreakable, keeping me safe inside in my own little world. A terrible tragedy caused me to bury myself and my intense emotions very deep. I made the decision to ‘get up and do what has to be done’ while others around me fell apart. Of course the depression manifested in other ways. I was diagnosed with anorexia nervosa and decided to get treatment in the nick of time. Doctors was convinced that, if I didn’t get treatment, that I would be dead within two weeks. I weighed in at 31,7kg and left the hospital when I reached 37kg. My body was more healthy, but my mind was still scarred. This ‘get up and do’-attitude stayed with me and today, 33 years after that fateful day, I am still such a person. I never procrastinate, I DO. This got me through the deaths of my grandparents, sister and parents. Others were allowed to cry and share their grief, I stood silently by and did the practical things. Remember, though, I chose this, so I don’t hold it against anyone. Thing is, there are days that I simply CAN’T ‘get up and do’. That is why I’m writing this today. I want to tell you something that I’ve learned over these years in the company of the Shadow. Despite being a ‘get up and do’-person, I still felt guilty about depression. Sometimes, if I felt not up to doing stuff, I thought I was a bad person. A lazy mother who have no strength to do the laundry, much less cook a meal. The Shadow still hid inside this little bubble with me and yes, the shell was still tough, but not AS tough as it was all those years ago. Hence me sharing all of this with you. As I grew older, I started to realize that I am someone who needs recognition as well. I’ve been so busy making sure those around me are happy and comfortable, that I completely forgot about myself. I never allowed myself to just be ME, Shadow and all. Depression is part of me, something that I cannot negotiate away. I had to make do with it in my life. I decided to embrace the fact that I have a mental illness and, nearly 10 years ago now, I threw away all my anti-depressants. They’ve served their purpose, I guess, but I just didn’t want to be hooked on those drugs anymore. I thought that, if I couldn’t figure out how to deal with depression while being of sound (not foggy) mind, I could always rethink the choice I made. Well, I’ve never had to. My decision to stop medication had more to do with the fact that I am a terrible patient. I simply cannot remember taking my meds, so simply NOT TAKING it was quite a relief. I didn’t need to remember anymore! Plus, I was 41 years old and already I was on more tablets than people in the geriatrics ward at the local hospital. It was just sick and tired of all those pills! Of course it took time. Withdrawal is difficult and it took about 6 months for me to be completely clear of all medication. It did not, however help my depression at all. I didn’t expect it to, as the medication was keeping a lid on most of my intense emotions. Everything boiled over, but I learned to embrace it over the years. I decided that I need to find some sort of way to live with the Shadow and not lose my mind. I also realized that I must be kinder and more forgiving to myself, like I have always been with others. At first it was incredibly hard. Like I mentioned earlier, the guilt at feeling low can be exhausting. I read a lot about depression during that period and discovered a brilliant book by Kay Redfield Jamison called ‘An Unquiet Mind’. Dr Jamison has bipolar disorder herself and writes about her own experiences. She mentions at one point how tired she felt during one of her episodes. She was so exhausted that she couldn’t even answer the phone. She couldn’t get up at all and had to crawl over the floor to get around. This book, in particular, inspired me to rather embrace the illness, than fight it with all the power I can muster. 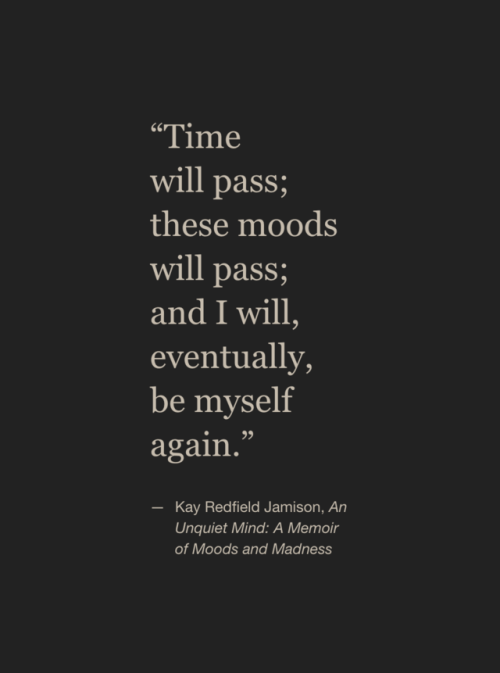 I may not be bipolar like Kay Jamison, but I could identify with what she goes through. Her testimony caused me to understand that, when you feel depressed, this exhaustion, this ‘cut off from the world’-feeling is, in fact, normal. I needed to deal with the guilt, put a damper on it and tell myself that feeling like this was NOT out of the ordinary for depression sufferers. I needed to allow myself to feel this way. It took time, though. I had young children, a husband, a household to run, I couldn’t just drop it all and be depressed. I had to find a way to make it work, a way to make me accept the Shadow, but not to let it rule the roost. Another thing that really inspired me to change my attitude towards depression was my sister. Clinically depressed for most of her life and on medication, which obviously didn’t work as well as she’d hoped it would, she lead a very sad life. By ‘sad’ I mean that, with her, the glass was always half empty. She couldn’t seem to find joy in life, although I recall good times we had, times of laughter and silliness. Of course I treasure those sparse moments, but overall I remember her being moody and low, someone who could never find the sunshine. It broke my heart when she died, simply because she barely lived. The day she passed I stood next to her bed and thought: “What a waste”. Such a beautiful woman, with a loving husband and family, why did she allow her Shadow to win? How is it that in her 50 years on earth she could not learn to live? In the end I had my suspicions about her death. She died of breast cancer, but knew she was ill months before the diagnosis. I warned her to go to a doctor, but she refused. Was it suicide by cancer? I guess we’ll never know, would we. My depressive episodes usually last about 7 to 10 days at a stretch and during that time I’ll do what I can when it comes to family and the chores I cannot do, well, I let it go. I also do not make contact with anyone, I allow myself to binge watch Netflix or read an endless array of books and I talk about my feelings with my husband, who is my closest, and probably my only, friend in the world. These days the personality I spoke about in the first few paragraphs, the quirky, crazy, weird girl, is still here. But now I can be more honest about who I really am. I am all that, the fruitcake, with depression and sometimes the depression needs some alone time with me. I’m beginning to see my depressive episodes as a sort of re-charge, taking time out to make sense of the world again. I do not enjoy feeling so down and I hate not having any energy, but knowing it will pass eventually really helps to make it bearable. The thing is, it does pass and, once it does, I go back to living my life with gusto. I don’t worry about what I’ve missed during my down period, something that I used to indulge in in the past, and I don’t wait anxiously for the next episode to strike. I am in control of my life. The Shadow is always in residence, that I can’t deny, but he is NOT in control of my life. Even when he jumps at me from a dark corner and overwhelms me for days on end, I know his power over me cannot last. I am NOT my depression, I am me, someone who has a life to live, someone who still has a lot of ‘get up and do’, quirkiness and loads of sarcastic comments in her and I shall not be stopped by my moods. Now, I understand that all this may sound strange to some of you. We are all different people and your experience with depression may be quite the opposite of mine. I’m not trying to tell you that it’s easy or that this is the answer to your dark moments. What I’m trying to say is that you should never give up. You should try and take control of your life and never allow depression to consume you. Most important, perhaps, is that you understand that your mood will lift at some point, even if it is only for a while. Have the courage to use that time of light and allow your life to shine. You have just this one life, make it count. Don’t bury it in Shadow. This entry was posted in Counseling, Depression, Emotions, Mental health (general), Mind, Self Improvement, Uncategorized and tagged Being Brave, Depression, Living with Depression, mental health, Self Improvement on November 20, 2018 by Sharon Halliday Hattingh. This entry was posted in Mental health (general), Self Improvement and tagged Daily Wellness Inspiration, meditation on November 20, 2018 by Sharon Halliday Hattingh.